Has the United States ever experienced a time when a foreign nation has attempted to buy up so much of our land all at once? As Michael Snyder details below, it appears the Chinese are on a real estate buying spree all over America as they are now the dominat 'buyers' of investment green cards. This is occurring as private equity buyers and hedge funds exit the buy-to-rent business en masse and are, as Mike Krieger explains, are desperate to pitch American property to anyone willing to keep Housing Bubble 2.0 inflated... it seems Zillow is more than happy to enable that, "Zillow agreed to make its U.S. property listings available to Chinese consumers through a partnership with a Beijing-based website." As The American Dream's Michael Snyder explains, the Chinese are on a real estate buying spree all over America. In fact, in some cases large chunks of land are actually being given to them. Yes, you read that correctly. China is on the way to becoming the dominant land owner in the entire country, and that is starting to alarm a lot of people. Do we really want a foreign superpower to physically own so much of our territory? There are some that are playing down this threat by making a distinction between the Chinese government and Chinese corporations, but things work differently over in China than they do here. In China, the government is involved in everything. In fact, 43 percent of all corporate profits in China are produced by companies that the Chinese government controls. And all of the rest of the companies are very careful to follow the lead and direction of the Chinese government. Gov. Robert Bentley said Friday that he will announce an economic development project in Thomasville, Ala., Monday morning. That project is likely a copper tube plant to be built by Golden Dragon Precise Copper Tube Group. A legal notice published Thursday indicates that the city of Thomasville and others intend to give land and other incentives to GD Copper USA, which state corporation records identify as a Florida-based subsidiary of Golden Dragon. The legal notice indicated the city plans to give Golden Dragon a 40-acre site. Thomasville Mayor Sheldon Day has said that land is in a city industrial park south of Thomasville High School. It includes a $1.5 million, 50,000-square-foot building that the city constructed in 2009 to attract businesses. China Vanke and Tishman Speyer signed a deal for a $620 million luxury condo project in San Francisco this winter. In April, another deal for a cool $1.5 billion was inked in Oakland between Zarsion and Signature Development Group. In June, several big deals in New York City went down. Zhang Xin, CEO of Soho China , joined forces with the wealthy Safra family (of Banco Safra fame) of Brazil to buy a stake in the General Motors Building in Midtown, The New York Times reported on June 25. Dalian Wanda Group, another Chinese developer, is planning to build a greenfield luxury hotel in Manhattan. 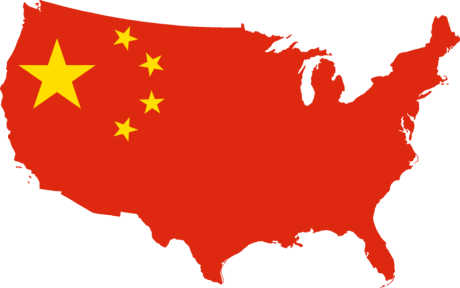 In other cases, the Chinese are gaining control over vast tracts of U.S. territory by buying up our large corporations. Smithfield Foods is the largest pork producer and processor in the world. It has facilities in 26 U.S. states and it employs tens of thousands of Americans. It directly owns 460 farms and has contracts with approximately 2,100 others. But now a Chinese company has bought it for $4.7 billion, and that means that the Chinese will now be the most important employer in dozens of rural communities all over America. Dozens of companies from China are putting down roots in Detroit, part of the country’s steady push into the American auto industry. Chinese-owned companies are investing in American businesses and new vehicle technology, selling everything from seat belts to shock absorbers in retail stores, and hiring experienced engineers and designers in an effort to soak up the talent and expertise of domestic automakers and their suppliers. Speaking of Michigan, one company known as “Sino-Michigan Properties LLC” actually had plans to buy up 200 acres of land near the town of Milan, Michigan. The goal was to build an entire “China City” with artificial lakes, a Chinese cultural center and hundreds of housing units for Chinese citizens. But of much greater concern is the huge wave of real estate purchases that are quietly happening all around us every single day. So what happens when we get to the point when the Chinese government and/or Chinese citizens own 10 percent of all the real estate in the entire country? Will it be a problem then? What about if we get to 20 percent or 30 percent? At what point will we be forced to admit that we have a major problem on our hands? Many of our leaders seem resigned to the fact that the future will be dominated by communist China. That’s according to Federal Reserve Board of St. Louis President James Bullard, who spoke to the Wall Street Journal on the sidelines of a conference during a recent visit to Hong Kong. “Attitudes in the U.S. are going to have to change, because the U.S. will not permanently be the global leader,” Mr. Bullard said. And this is one of the guys that is running the U.S. economy? There is more than one way to dominate your enemy, and the Chinese understand this. Sadly, most Americans have absolutely no idea what is happening. ...just last year I covered how corrupt Chinese are laundering their money through U.S. real estate in my post: Corrupt Chinese Politicians are Buying Billions in U.S. Real Estate. This is a very important trend that we must keep our eyes on in the years ahead. Particularly since private equity buyers and hedge funds can no longer make a return on buy-to-rent, the real estate industry will become increasingly desperate to pitch American property to anyone willing to keep Housing Bubble 2.0 inflated. Zillow Inc. agreed to make its U.S. property listings available to Chinese consumers through a partnership with a Beijing-based website. Have fun being a peasant under your Wall Street and Chinese feudal lords.